Researchers have found evidence for “chronesthesia,” which is the brain’s ability to be aware of the past and future, and to mentally travel in subjective time. They found that activity in different brain regions is related to chronesthetic states when a person thinks about the same content during the past, present, or future. Image credit: Lars Nyberg, et al. ©2010 PNAS. (PhysOrg.com) -- The ability to remember the past and imagine the future can significantly affect a person's decisions in life. Scientists refer to the brains ability to think about the past, present, and future as "chronesthesia," or mental time travel, although little is known about which parts of the brain are responsible for these conscious experiences. In a new study, researchers have used functional magnetic resonance imaging (fMRI) to investigate the neural correlates of mental time travel and better understand the nature of the mental time in which the metaphorical "travel" occurs. The researchers, Lars Nyberg from Umea University in Umea, Sweden; Reza Habib from Southern Illinois University in Carbondale, Illinois; and Alice S. N. Kim, Brian Levine, and Endel Tulving from the University of Toronto in Toronto, Ontario, have published their results in a recent issue of the Proceedings of the National Academy of Sciences. "Mental time travel consists of two independent sets of processes: (1) those that determine the contents of any act of such travel: what happens, who are the 'actors,' where does the action occur; it is similar to the contents of watching a movie  everything that you see on the screen; and (2) those that determine the subjective moment of time in which the action takes place  past, present, or future," Tulving told PhysOrg.com. "In cognitive neuroscience, we know quite a bit (relatively speaking) about perceived, remembered, known, and imagined space," he said. "We know essentially nothing about perceived, remembered, known, and imagined time. When you remember something that you did last night, you are consciously aware not only that the event happened and that you were there, as an observer or participant ('episodic memory'), but also that it happened yesterday, that is, at a time that is no more. The question we are asking is, how do you know that it happened at a time other than 'now'?" In their study, the researchers asked several well-trained subjects to repeatedly think about taking a short walk in a familiar environment in either the imagined past, the real past, the present, or the imagined future. By keeping the content the same and changing only the mental time in which it occurs, the researchers could identify which areas of the brain are correlated with thinking about the same event at different times. The results showed that certain regions in the left lateral parietal cortex, left frontal cortex, and cerebellum, as well as the thalamus, were activated differently when the subjects thought about the past and future compared with the present. Notably, brain activity was very similar for thinking about all of the non-present times (the imagined past, real past, and imagined future). Because mental time is a product of the human brain and differs from the external time that is measured by clocks and calendars, scientists also call this time subjective time. Chronesthesia, by definition, is a form of consciousness that allows people to think about this subjective time and to mentally travel in it. Some previous research has questioned whether the concept of subjective time is actually necessary for understanding similarities in brain activity during past and future thinking compared with thinking about the present. A few past studies have suggested that the brains ability for scene construction, and not subjective time, can account for the ability to think about past and future events. However, since scene construction was held constant in this study, the new results suggest that the brains ability to conceive of a subjective time is in fact necessary to explain how we think about the past and future. He added that, at this stage of the game, it is too early to talk about potential implications or applications of understanding how the brain thinks about the past, present, and future. Where is that screen located? Space and Time? I wonder what Albert Einstein would have said about this article. He would probably agree, right? Correct me if this is a wrong summation of the article: scientists prove that we can plan ahead. @NotAsleep not only that, they also prove that we can remember things. That must be the discovery of the century. What's interesting about this is that the same tests can now be done on animals, with an objective metric. It's been claimed many times that animals only live in the 'now', have no sense of self, don't have true emotions, yadda yadda yadda. Up until now, it's always been handwaving and dueling opinions. I suspect (personal opinion only) that we'll find once again that there's less difference between us and other animals that we think. Alright, this just seems like an even poorly reworded and less thought out version of or the piece on jumping consciousness through time found at trueliberty.us. Check it out and notice the similarities in principle. Physorg.com seems to be finding a lot of products lately that mirror what is written at trueliberty.us. Here is a link to the jumping consciousness thing. If the brain functions on on mental time, and we are 'consciously' on a different plain of time. Is it possible that we can 'reboot' ourself to a different point in time depending on events that had actually taken place that the brain recognizes took place? If the 'event that happened last night' didn't actually happen 'last night' then why can't we 'reboot' our brain to that actual event? Some would say 'well thats a coma', but is it? If our brain actually functions on 2 separate plains? It seems like there should be a way to 'navigate' or 'steer' actual time via our mental time. it's about finding regions of the brain involved,like the ones for sight and smell and not that we plan ahead or recall events in time,which we all know we do. I think the title of this article is worded poorly, as scidog mentonied, they found out what parts of the brain responsible for it and how it works. An idiot could tell you we can do these things but they couldn't tell you how, which is what they were working on. I think people are completely missing the point. Yes, we all know that we have a concept of past, present, and future. This research is just mapping HOW we do this. A lot of our current knowledge of the brain is theory, this is the time in science where we confirm HOW this stuff works. 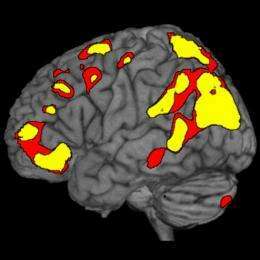 This research is valuable in mapping how the human brain works! This is what made me write the post 'We are our own guardian angels' now I know for sure. We remote view all the time just for survival. We use our subconscious powers to influence others. We are psychic, energetic beings. Alas, this truth is the biggest threat to national insecurity. Now, I should read the rest of this huge post before I say anymore. So yeah, you could say that you can travel through time in your mind if you want... whenever you think of the past, but that's not anything. You are absolutely correct, but by the time people figure it out, it will be way too late. It makes me think of "deja vu", that weird sensation that you're living something you foresaw in the past. This is caused by perceptions going through memory centers of the brain, merging with the normal path to consciousness. We have long known the human mind is a time machine. In reality; there is no time. Now is all there is. @OdinsAcolyte: to expound on your thought. I have long believed that time (as most people conceive of it) is simply a tool we use to measure change. The way the human brain stores memories has led us to believe in this concept of "time". Really, the universe just *is*, but is undergoing constant change. This change is the "time" that physicists talk about, where as time on a clock is a function of the human mind. We already know of a few animals that do this. Squirrels for one have been shown to plan ahead and to be able to deceive as well. That fuzzy line keeps getting fuzzier all the time. Space-time within dream-time. Brain time. it is subjective. In brain time there is no limitations to time like we have now in our linear time. In brain time we can always accelerate at speed of light. And we can see into black hole with brain time. That is the purpose of this article. I seek not to know all the answers,but to understand the question.And what is the question.Can I,can we be trusted with the knowledge and power that comes with the infinite intellegance contained in our thinking potential?To ask the correct set of questions that could lead to the ultimate answer. This is intresting, in the past I have had several incidents happen to me related to seeing future events. I was able to see things that later occured usually a few minutes to a few hours ahead, I was not thinking about them before hand at least not consiously! except on type that has occured several times related to Roulette wheel in vegas, I was able to pick winning numbers everytime each time I return I am able to do the same- Made me wonder if i was making it happen or did I know it would happen? this article might explain it! Goog Luck on your studies! Happy New Year!!! For some reason, this article gave me a feeling of deja vu. I think that this article quite clearly identifies the purpose of this study, which many of the commentators have ignored. Though this study didn't provide a key to time travel (as we all wish some study would) the conclusions that it has drawn could push our understanding of memory and consciousness forward by identifying the portions of the brain associated with past,future, memory and imagination. Pretty friggin neat if you ask me. Regardless of actual capacity to travel through time, this may lead to technologies that can induce the sensation of doing so. Imagine if you could use a device to make a witness relive the experience exactly as their mind recorded it by stimulating the proper parts of the brain. Memory might cease to be subject to emotions developed after the fact regarding the previous event, essentially you would be able to physically deny your subconscious the right lie to you. I think that this article quite clearly identifies the purpose of this study, which many of the commentators have ignored. I was not very clear with my short comment. Until we find where the TabulaMentis (tablet of the mind/slate of the mind) is located, then it will be like asking a blind person for directions. The article refers to subjective time. I noticed you have an interest in perpetual motion which is something most scientists would say is not possible. Long live electricians.